Blackjack is one of the most famous casino games both in land based and online casinos. A lot of people know how to play the game but novice individuals will surely have a hard time at first. Learning the rules of the game and the basics will be very helpful to any player. Before you play the game, you have to choose the right table. Newcomers should always keep in mind that one of the most essential things to think of is the sign that declares the wager limit. You should always check for the minimum required bet and the maximum required bet since it’s always posted on top of the table. You should look for a table that fits the size of your wager. You will always find tables with small amount of wager crowded; in this case, you can choose another table but make sure that it’s meant for blackjack and not for other games. Next important thing is to be an observer with the type of game being dealt with by players. The player should buy chips coming from the dealer for the wagers. The player should do this after he sat at the table. After the sign is given, you should place your cash just on the table in front of you. You can wager more than 20 times. If you will wager 5 USD, you can buy in 50-100 USD. You shouldn’t give your cash to the dealer for security purposes. The dealer shouldn’t take any amount from you or from other bettors directly from the hands. You just have to put the money on the table and he will pick that up and change it for an equal amount of chips that you will use. You cannot get any change as well. The chips are colored and they adhere to the standard color used in a regular casino. Before hand, you should learn the value of every chip color and then the denomination they have. You should always take a closer look at the values of the chip and check if the amount of chips corresponds to the amount of cash that you have given earlier. If you have any queries, you can ask the dealer because part of his task is to help the gamers in learning and playing the game. The dealer should play his hand in a specific manner and there are no other choices allowed. There are rules that will help you know how the dealer will draw. At any casino, the player can tell which rule is implemented and used by the dealer at the table. As soon as the dealer got an Ace, the player may have an option to make insurance wager before the hand is played. 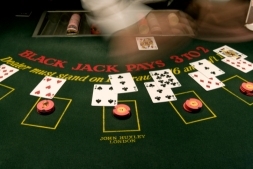 If the player has a blackjack and the card of the dealer is an Ace again, the player will now have the option to take the money.